The first month of 2019 is about to end! It has been a smooth ride so far and it is getting better! Before we end this month, we would like to introduce to you our new exciting contents! The Holy Battlefield Colosseum is here! A breathtaking 1v1 battle between 64 Heroes is about to start! Heroes can obtain Strife Tokens upon participating in the tournament. You can use these tokens to participate in various events. But don’t lose hope! Even if you have a low Combat Power and Level, it doesn’t mean that you cannot participate in the Colosseum and earn tokens. You can still get tokens from betting on the Hero that you think will win. If that Hero wins the match, you’ll earn some Strife Tokens! The Colosseum will progress on its pre-season before the official season. We will make sure that all of the lacking points of the Colosseum such as the balance between the matches during the pre-season will be improved on the official season. – The Open Fortress Siege that takes place every Saturday at 8:10 PM will be canceled due to Colosseum’s schedule. And even though the Colosseum’s pre-season will end based on its schedule, the Open Fortress Siege on this said time will not progress. It will now progress for 5 times per week. – Every Wednesday and Saturday, a participation announcement will be made starting from 5 minutes before the Colosseum starts. Heroes can also apply for participation from 30 seconds before the start of the Entry Battle. * Tournament Rooms are first-come-first-serve. 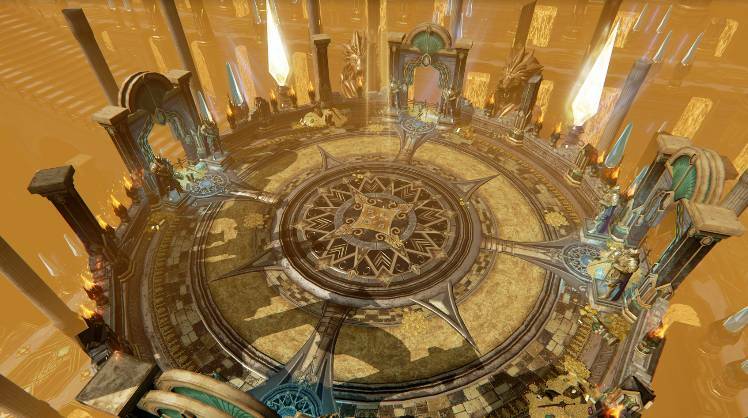 Only 64 Heroes can preoccupy these Tournament Rooms due to the Colosseum’s feature. 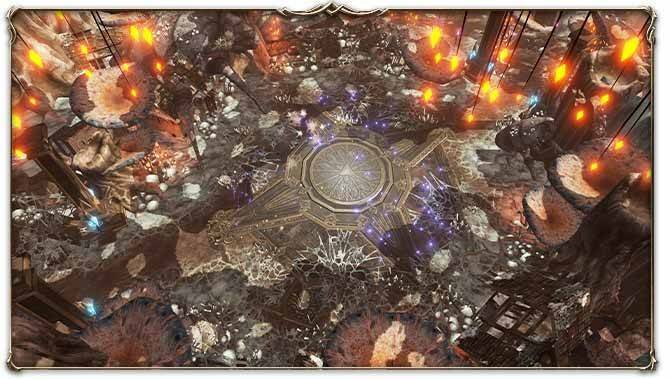 – Battlefield of Light has buffs (Stat. Increase and Movement Spd. Increase) that will appear in 5 different locations inside the map. – Buffs like Movement Spd. Increase and Damage to a nearby opponent will appear at the middle of this battlefield. – There are also blue flames that are erupting randomly inside the map. These blue flames can deal damage to Heroes. – 10 seconds before the Colosseum battle progress, a message indicating the start of the battle will be shown to the heroes. ※ If a participant in the Colosseum logged off before the game starts, an AI will take over and will fight against the other participant. The disconnected participant won’t be able to participate in the Colosseum while the AI is in the middle of the match. ※ If a participant had disconnected due to unstable network or crashing of the application before the match starts, the whole match will be paused. A “The match is temporarily paused due to unstable network” pop-up will show up. ※ Pausing of the match due to unstable network or crashing of the application is limited to once per participant. If this issue happens again, it will not be paused anymore. – Each participant has 2 lives. If they manage to defeat their opponent twice, the winning participant will advance to the next round. ※ The cooldown of Normal and Rare Skills that are used before being defeated will not reset once the participant revives. – The duration of each match lasts up to 3 minutes. The participant with the least number of revives will win the match if the time runs out. If both participants have the same number of revives, their remaining HP will determine the winner of the match. ※ If the remaining HP of both participants is the same, the one with a higher Combat Power will win the match. – The entry battle will progress for 15 minutes. – A Blind Match will happen and the challengers will have to take away the Entry Rights from the 64 defenders who have occupied a room. – Heroes can participate in the entry battle by tapping the “Participation Request” button of the Colosseum’s Main Screen. Heroes who haven’t occupied a room can choose any room to battle with. If the challenger gets to win the match, that contender can take away the defender’s Entry Rights. * Each participant has a fixed number of entries, and it will be deducted once they have successfully matched with other participants. * The number of entries for Entry Battle are not rechargeable. – If there are less than 64 Heroes to participate in the Main Battle and there’s an empty room left, the participants can just occupy the empty room. They can get their Entry Rights without doing any battle. – The main battle will proceed after a certain amount of time from the Entry Battle. – The tournament will progress with Round 64, Round 32, Round 16, Round 8, Round 4, and Final Round in order. – Starting from Round 64 ~ Round 16, only the “Spectate” is available. • Starting from Round 64, Heroes can spectate other Heroes’ matches real-time. • The spectators can watch both of the participants’ visual range during their match. • Starting from Round 64 until Round 16 of the Colosseum, Heroes can check the list of the matches in the Colosseum’s Main Battle Board. Defeated participants will be marked with gray color and will be shown as defeated. * The participants in the Colosseum cannot spectate other participant’s match. – Once there are only 8 Heroes left in the Colosseum, other Heroes will be able to “Spectate” and “Bet”. • Before the match starts, Heroes can bet to their selected participant by tapping the “Betting” button. Bettors can obtain Strife Tokens based on the match’s result. This button can be seen at the bottom-right of the screen after clicking the spectate button. • Adena will be used for betting, and reward will be provided as Strife Tokens. • Betting is available starting at the minimum of 10,000 and maximum of 100,000 Adena. • Additional Strife Tokens can be obtained depending on the amount ratio of the bets between the two participants. * If you bet on a participant with a low betting amount in a match and that participant won, you can get more Strife Tokens. – The Colosseum has a basic reward that will be distributed for each battle. There are also special rewards that will be distributed to the Highest Ranking Heroes. Strife Token Box will be awarded regardless of the match’s result. Entry Battle: 50 Tokens will be distributed for each entry. Main Battle: The number of obtainable Tokens will increase whenever the round advances. 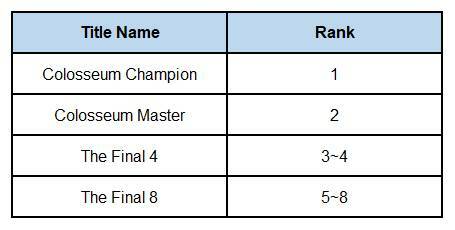 The seasonal title “Colosseum Title” will be given to Rank 1 ~ 8 participants. – An aura effect will be emitted from your character’s body upon equipping a Colosseum Title. 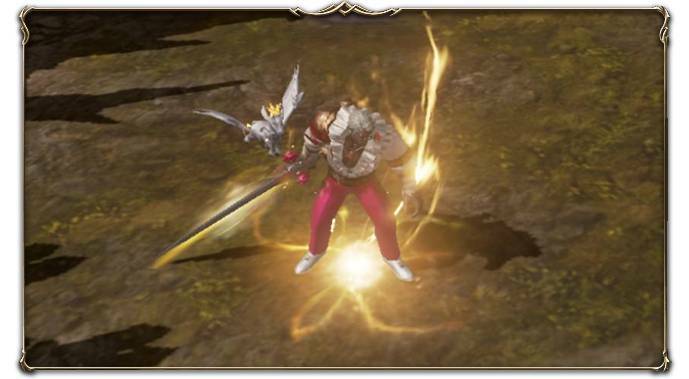 – This aura effect works just like the weapon enhancement effect. It will disappear once you unequip the title. ※ Colosseum Title will disappear once the next season of the Colosseum starts. A new Temporal Rift with Human-type monsters and a new kind of Cloak will be added to the game on February! More information about this will be announced on our further notice. Humanoid Attribute Equipment has been added to the game! Heroes will now be able to fight Human-type monsters with this equipment. – Humanoid Attribute Equipment has been added to the Equipment Collection. – Humanoid Attribute Equipment Salvage System and Recipe Exchange System has been added. – Humanoid Attribute Scarecrow has been added to Magnadin Training Ground. – Humanoid Attribute Equipment has been added to the Castle Siege Festival Reward. – New titles related to Humanoid Attribute Equipment (Master of Execution and Master of Fortified) have been added. Equipment Attribute is very important in the game. Many of our Heroes are struggling on strengthening their equipment due to the variety of Equipment Attributes in-game. And because of that, we decided to bring the Enhancement Exchange System to the game. This system will help to reduce our Heroes’ equipment strengthening troubles. 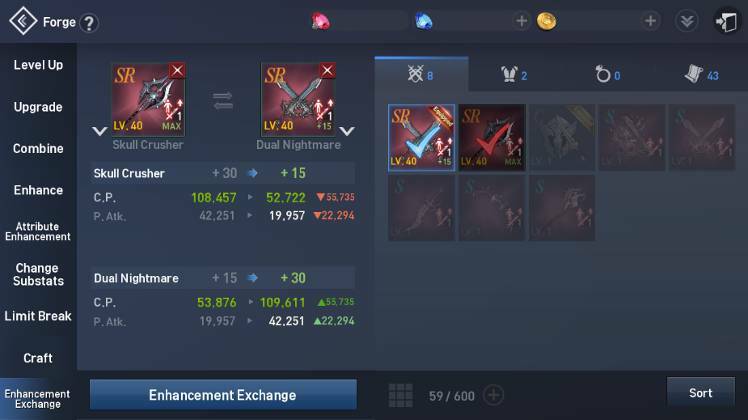 – Heroes can use the Enhancement Exchange by going to [Forge] and tap the [Enhancement Exchange] Menu. – Adena or Diamonds can be used for exchanging enhancement level. – Enhancement level is the only thing that can be exchanged. Limit Break and Attribute level are excluded. – Bonus Success rate will be carried over upon doing an Enhancement Exchange. 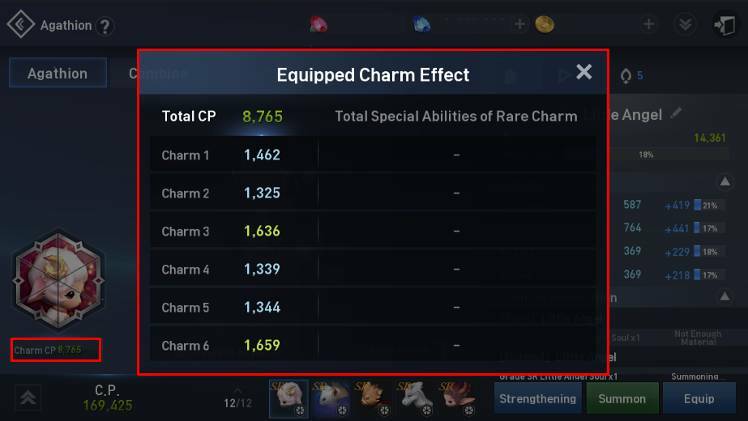 – Heroes cannot use the Enhancement Exchange System if the items that they are trying to exchange have them same enhancement level. – Each equipment has a maximum enhancement amount that can be exchanged per grade. Addition bonus stats will be added if you reach a certain equipment’s achievements in the Equipment Collection. 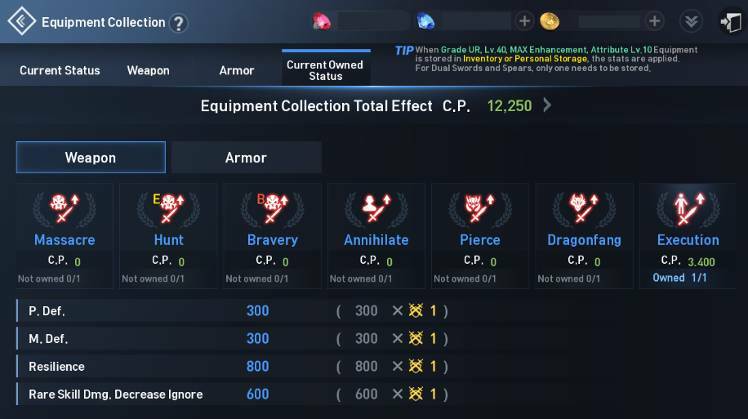 – Equipment Collection additional bonus stats is applicable to weapons and armors that you owned and kept. 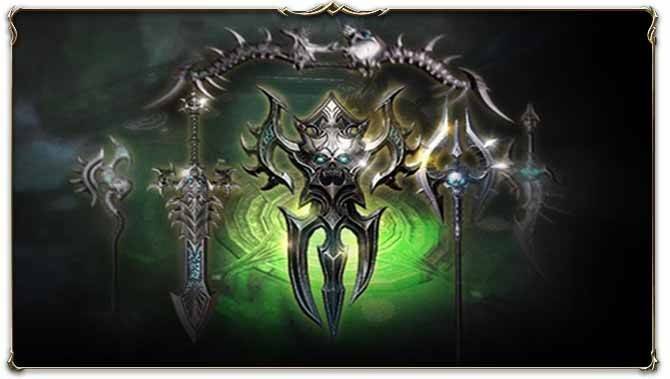 – For Dual Sword and Spear weapon, the additional bonus stats will be applied if one of these weapons met the conditions. 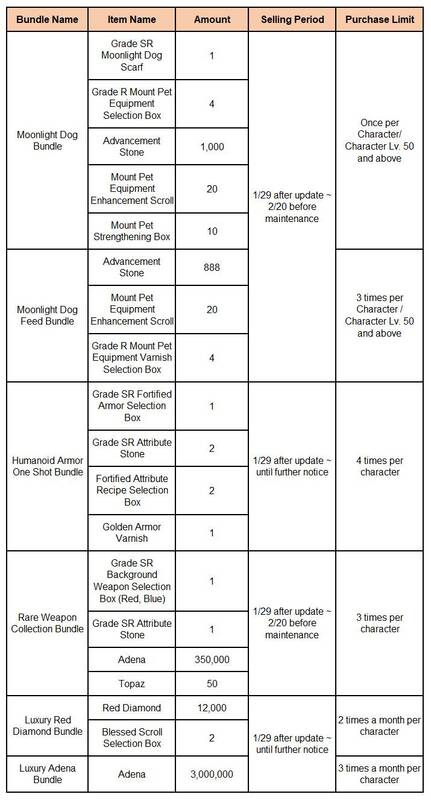 – For Armor, the additional bonus stats will be applied if you keep all 4 parts of that Equipment Attribute. 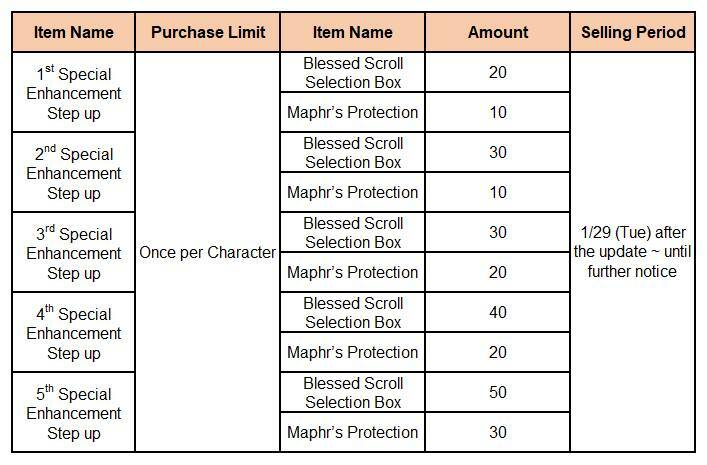 – If the equipment that is being kept inside the Inventory was sold, salvaged, listed in Trading Post, or stored inside the Account Storage, the additional bonus stats will be disabled. However, if the equipment is just stored inside the Character Storage, the additional bonus stats will be applied. For all of our Heroes who have suffered a lot due to failed enhancement attempts, we have good news for you! A Bonus Rate will be added to your next enhancement attempt whenever you fail one! – Success Bonus Rate will be applied whenever Heroes fail to enhance their Character Equipment or Mount Pet Equipment. – The Bonus Rate will be applied depending on the equipment’s enhancement level. 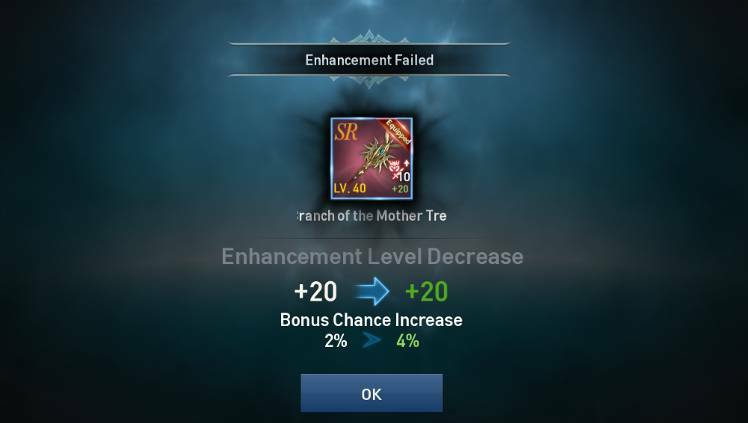 – The Bonus Rate from a failed enhancement attempt can be accumulated. It will reset once your enhancement succeeded. – The accumulated Bonus Rate might be shown as over 100% due to its accumulation. However, 100% will only be applied to your next attempt even though it was shown like that. – Heroes can now check the Combat Power of their Agathion’s equipped charms individually. 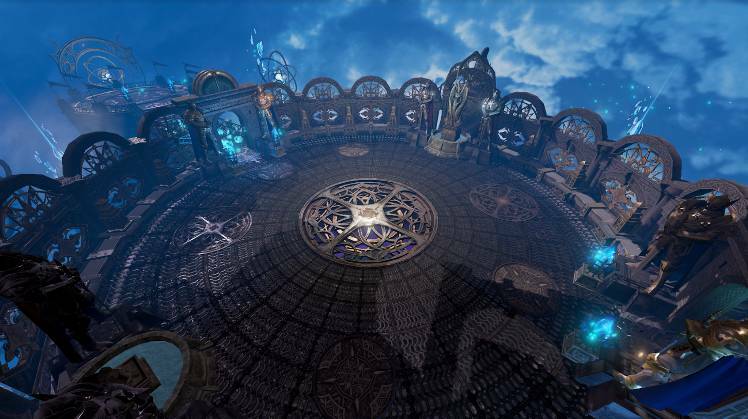 – Agathion’s Average Growth Rate has been added to the game! This makes it easier to see the partial growth of your Agathion. 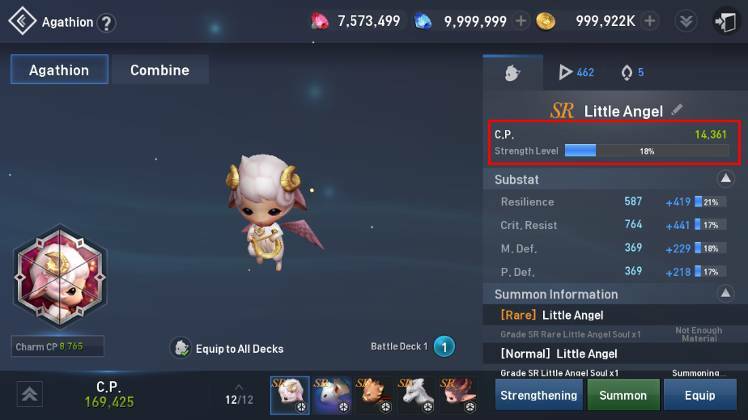 * What is the Agathion’s Strength Level? It’s the average amount of your Agathion’s Strength Value, ranging from 1 to 4 Substats. – The battle status remains for 10 seconds after being defeated in the PVP has been fixed. – Players are now able to check the current ranking per Race and Class by going to Ranking > Character > Combat Power tab. – Battle Deck per Contents has been added. – Recruit Party Button from the chat has been improved to make Heroes join any party easily. – Costume Stats. UI has been improved. – Multiple Nemesis Purge System has been added. Prepare to meet our newest and one of the cutest Mount Pet in Lineage2 Revolution! We also prepared awesome bundles that you’ll surely like! Excited to know more about this? ※ You can immediately obtain the new Mount Pet “Moonlight Dog” after purchasing the bundle. ※ This Mount Pet will be obtained as Grade SR.
※ This Mount Pet can also equip Mount Pet Equipment. ※ You cannot Limit Break this Mount Pet. * This costume can only be purchased on its discounted price starting from 1/29 (Tue) after the update until 2/19 (Tue) 11:59 PM (UTC+8). You can purchase this costume with 2,000 Blue Diamonds after the event period ends. What are you waiting for? Go grab yours now! Hey Buddy!, I found this information for you: "[SEA] 1/29 Update Notice & New Items Added to the Shop". Here is the website link: http://l2revolutionworld.com/sea-1-29-update-notice-new-items-added-to-the-shop/. Thank you.